Miss Berry writes to Mrs. Auchincloss to ask for further donations because some of the students at the schools will have to be sent home in January if they don't get help. She says that she has their names before her and cannot make up her mind which ones will have to go and that she will watch for Mrs. Auchincloss' reply. She asks that Mrs. Auchincloss make a "real Christmas" for a Berry student. 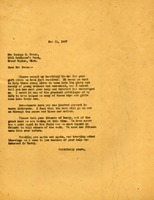 A Letter from Martha Berry to "Friend"
Martha Berry addresses "Friend," sharing information about Berry Schools in hopes of receiving a gift in return. We assume $5 was gifted in return from "Anon" on November 28, 1928. 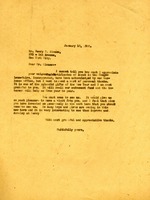 Mr. Herbert L. Aldrich of New York City sent $50 in response to an appeal letter sent by Martha Berry. 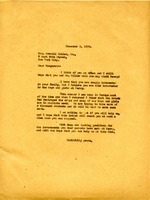 Letter from Martha Berry to "Friend"
Martha Berry shares information about Berry Schools in hopes of recieving a gift in return. Miss Berry thanks Mrs. Evans for the gift she sent to The Schools, saying it greatly encouraged her. She also says that gifts and investments will help the work go on through the years. Miss Berry asks Mrs. Evans to tell her friends all about The Berry Schools and the great need of funding they have.